Perfect for cooking pasta and vegetables and simmering sauces, you’ll rely on this All-Clad Stainless-Steel Saucepan more than any other pan in your kitchen. An aluminum core bonded between a stainless-steel interior and brightly polished exterior ensure a quick and even distribution of heat. Ergonomically designed, long cast handle stays cool and comfortable in your hand no matter how hot the stove is. 6 x 4 1/8" 3-Ply Bonded Construction Sauce Pan With Lid. With its sloping sides and wide brim, nothing can surpass this 3-qt Saucer from All-Clad when it comes to browning meats, sautéing vegetables or reducing liquids. Constructed with an 18/10 stainless interior, pure aluminum core and polished, stainless-steel exterior that won’t react with acidic foods and liquids, it maintains and distributes heat with superior efficiency. Ergonomically designed, long cast handle stays cool and comfortable in your hand no matter how hot the stove is. 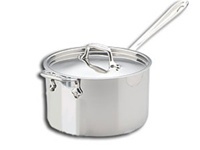 10 x 3 1/4" 3QT 3-PLY Construction Bonded Saucier with Lid. Perfect for cooking pasta and vegetables and simmering sauces, you’ll rely on this All-Clad Stainless-Steel Saucepan more than any other pan in your kitchen. An aluminum core bonded between a stainless-steel interior and brightly polished exterior ensure a quick and even distribution of heat. Ergonomically designed, long cast handle stays cool and comfortable in your hand no matter how hot the stove is. 8 x 3 9/16" 3-Ply Bonded Construction Sauce Pan With Lid.